It's natural to want to share what's going on in your life with your friends; it just becomes more interesting when you're an adult. I suppose this is no different than handmade Christmas cards or homemade baked goods, but a lot of the friends in my life are going to be receiving LEGO this year. The idea started small enough as most trends do. I gave a small set to a friend in Seattle back in October when I was visiting during BrickCon 08. It was the first time I had given LEGO as a gift to another adult and it was fun to watch him appreciate the differences between the sets today and those when we were kids. Next, it was a series of LEGO basketball minifigures, which are as much about sports as they are about LEGO. These are great gifts for testing the water to see if you're totally off the mark with a given friend. Ultimately this is partly altruistic and partly selfish. It would be fun to have more friends that were into LEGO. 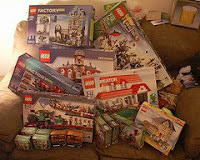 However the true motivation behind all of this is that I hope they get the hint and buy me LEGO in return.